I think that looking good can give you a boost of confidence. I know that when I have a new outfit on or my hair looks great, that I feel good. Now, I never wear makeup. The only time is wearing a bit of tinted moisturizer and/or blush, and I almost always curl my eyelashes (they are really long and the ones in the edge of my eye get tangled – OUCH). I am actually incredibly happy that I don’t wear makeup at my age. I’ve heard so many girls say that they feel like they can’t even leave the house without makeup and that they don’t feel comfortable without it. I am not saying that makeup is bad. I think it’s its own art medium and can give you a serious confidence boost. It’s also a pretty fun way to express yourself! My issue with today’s society is that so many people can’t seem to love themselves in their own skin. That’s these tips are for: some easy ways to maintain your natural beauty! 1) Skin Care – Whenever I see someone who has truly radiant skin, I think they are absolutely beautiful and get jealous immediately. I have very large pores and blackheads and the occasionally pimple (I think I’ve really ‘outgrown’ my acne stage, thank goodness). My skin care routine has been the same for quite a few years. I don’t cleanse my face in the morning, I just splash some cold water on it. Then I follow up with a moisturizer with SPF. In the evening, I use a cleanser and then a light moisturizer. Once or twice a week I’ll use a clay mask or exfoliator. I try to keep my routine simple. I always put on hand cream before bed, and if I remember I’ll moisturize my arms and legs. I also put on a soothing lip balm. Your skin care could differ completely from mine. Experiment until you find something that works for you. 2) Eyebrows – I have naturally thick eyebrows (both a blessing and a curse). I am constantly tweezing and getting them waxed. Personally, I find nothing can make my face look better than having nicely shaped eyebrows. Filling in my eyebrows with makeup has never really been an option for me so I’m not really sure what to tell you about that idea. I think just having them nicely shaped and cleaned up from stray hairs is perfect. If you have never tweeted your eyebrows before, go to a professional. At least for the first time, and they should be able to give you some good tips. 3) Hair – I wash my hair every other day. I only really have two guidelines for hair: it should be clean and out of your face. Experiment with products (I use a hydrating shampoo and conditioner because I like to keep my hair healthy) and develop a solid routine. Sometimes I also use hair oil on the ends. When it comes to styling your hair, I like to limit myself to fifteen minutes (I normally never reach that, but I think it keeps you prioritizing that your hair isn’t that important). I love styling my hair because there are so many different things to do. Your hair is unique, just like you. I normally straighten my hair (my hair is straight, so I just have a few kinks to work out) and always pull back the front somehow. I really like French braiding one side back or wearing headbands. I also use classic ponytail. My hair is currently at a growing out stage, but when it was longer, I did lots of braids and buns. 4) Shave – I believe this is totally optional, depending on your views, but being from Canada and just not liking body hair in general, my razor is used quite often. Legs, armpits, bikini line (if that’s your thing), I think are all musts. Nothing makes me feel more uncomfortable as walking out in shorts with hairy legs. Just pick up a razor and some shading cream and follow up with moisturizer after. Super easy. 5) Nails – I really like painting my nails, because it makes me not chew them (I have a really bad habit here, guys), but i think it’s most important to have your finger and toenails be clean and trimmed. Nothing else I think is really that important. Invest in a pair of good quality trimmers and maybe a nail file. Just be careful doing this! You don’t want to cut your nails too short. That’s pretty much all I can think of. Notice there was nothing like, contour you nose or wear colored contact lenses, because that’s not naturally you! If you like that stuff then that’s fine and dandy, but it think it’s always important to learn to love and accept yourself as who you are. Lately, beauty has been getting me down. I’ve felt bad about how I look and keep comparing myself to others. I wish my nose looked more like hers…her hair is so perfect…she must not have a worry in the world. This has led me to come up with some ideas on how to feel and look more naturally beautiful. The first part will be all about attitude. Truly the most important step is attitude. I think it really either makes you or breaks you. What’s a pretty face if they are actually really mean on the inside? 1) Stop comparing yourself to others – This to me is the most difficult step. With media shoving down their ideas of perfection, it makes us think that our beautiful and unique features are actually flaws. Learn to accept not only yourself, but everyone around you. We are all different. If you try and focus your whole life about changing your face shape, you’ll only get sad about something you can’t change. 2) Don’t think it’s bad to think you are beautiful – Often, if I have a day where I feel particularly pretty, I think I’m full of myself or delusional and end up feeling sad again. Why can’t I feel pretty? Understand it’s not a bad thing to love yourself. 3) Be a nice person – Be grateful, kind, listen to others, the works. This is what truly makes you beautiful. 4) Don’t make looks define you or rule your life – There are so many more important things. I think volunteering at your local hospital is a lot more beautiful than the shade of lipstick you have on. That being sad, you don’t have to ignore looks completely. I think that if you feel pretty, it can lead to confidence. Just remember to prioritize. 5) Let someone know they are beautiful every day – You know how great you feel when someone compliments your hair or your eyes. Make someone else feel that way too. Saying a few words like “I like your blouse!” can give someone a great feeling. I will post some beauty/appearance tips later! This is the eighth book in the BSG series. It isn’t one of my favourites, but I still enjoy reading it. In this book, Marty, the BSG’s dog goes missing. It causes a lot of tension between the friends and to top it off, Katani and Kelley’s new riding lessons might have to get closed down unless they can raise 10,000 dollars. Will the girls manage a way to manage all of this while still being friends? And what happens when a celebrity baseball player enters the mix? This book really shows what happens when people don’t share the same views. It can cause tension and make things difficult. What the BSG later show, is that in order to get anything done, you have to work together, even if you don’t all want the same thing. It also shows that things have a way of working out in the end. If you ever disagree with your friend (which is bound to happen – it’s natural! ), instead of getting mad and shutting her out, why not try to see both sides of the story and work things out together. A disagreement is no reason to end a friendship! 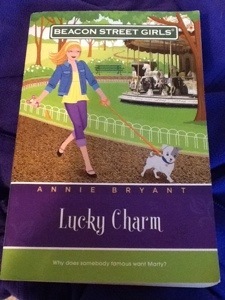 Lucky Charm also talks about, well, lucky charms and superstitions. Do you believe in lucky charms? If so, do you have any. I don’t think I believe in them, but I think it’s sort of fun to have a ritual or something special. It’s comforting. Chances are, you’ve probably gotten hit by the green-eyed monster some time in your life. You’ve been jealous over how someone looks, their athleticism, their smarts…the list could go on forever. I’ve been there, and still go there. It’s hard to realize what amazing things you have when all you do is compare yourself to others. Jealousy has the opposite affect that you want it to have. Recently, I was jealous of my friend for a bit. She’s very pretty, nice, smart, athletic, and is really good at meeting new people. I’m a little more shy and awkward in new situations. I began comparing everything I had to her. The number of Instagram followers, likes on a picture, grades, awards…creepy, huh? The thing that really gets me now, is that I would acknowledge the things I excelled at, too, and would just skip over them, like they didn’t count. I was thinking that I had to be better or the same to her in every single category that she was good at. I wasn’t taking time to realize that we will always be different. We aren’t supposed to be or want to be exact molds of anyone. So why was I so obsessed and jealous? I was watching a video (think it was by Bubzbeauty, but I’m not sure) about jealousy on Youtube, because I wanted to hear someone else’s point of view. At the end, I think I had really understood that I am supposed to be different, and that’s not a bad thing. I can draw okay. I am good at school. I think I am a good role model to my younger cousins. I’m a good team player in volleyball. I like playing piano. I like blogging. I like reading. All of these things define me and make me different. No one else will ever be like me and I will never be exactly like anyone else. So I think the key to getting over jealousy, is really think about what you are good at and appreciate that you are different. Don’t just think grades or after school activities – dig deeper. Life isn’t a competition. Just do your best and do what you love. 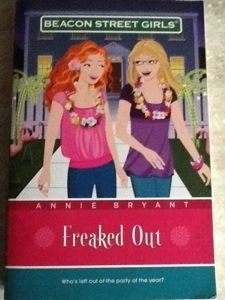 I just finished Freaked Out by Annie Bryant. It is the seventh installment in the beacon street Girls series. This book is great because it deals with topics like exclusion, choices, and struggling with school. In this book, Maeve is fearing out about her math grades and Avery doesn’t get invited to the party of the year…which may be more interesting than anyone thought it would be. It’s really good and I totally recommend it to anyone. Freaked Out talks about underaged drinking. I am not really a drinker, and have only had a quarter of a beer before. It brings up how dangerous it can be and how the side affects really aren’t that cool. It’s a good reminder to stay safe and in the back of the books it brings up some information about drinking. It also discusses choices. This can be the underaged drinking or even just how you handle situations. I really like this book because it talks about exclusion. I’ve been hit with that one quite a few times so it’s nice to see how Avery handles it. I think that with exclusion, you can either be incredibly sad about it (which is easy to do), or you can make the best of it and have a really incredible day. And, in ten years, are you really going to care which parties you didn’t get invited to? You should totally read this! 2) It’s fast – The dialogue keeps your attention because it’s so fast! 3) It’s funny – Amy Sherman-Palladino’s writing is hilarious. It’s very witty and pop-culture-y, which I love! 5) The actors – They were all unknown to me at first. Now I love and look up to each one as themselves and not just their characters. Plus, Sutton Foster is just amazing! 6) It’s realistic – Nothing crazy really happens (like magic or murders). Instead, it’s all about real life experiences and problems and stuff like growing up. It is not boring at all and is actually very refreshing and different from every other TV show I’ve seen. 7) Watching the characters grow – It’s nice being my age and watching a show where people really do grow up and mature and change their lives (even at Michelle and Fanny’s age, ha ha). 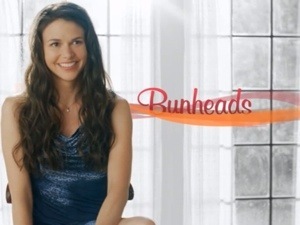 Bunheads will never get old for me and I think it will always be as comforting and wonderful to me as when I watched it the first time. Even though it was cancelled last year. I am thankful for 18 incredible episodes. Please watch it. I know you won’t be disappointed! Friendship only works if you can give all of these things back to someone else. Tips on being Fit and Healthy! Summer is here and these past couple of months I have been really interested and trying to get healthy and fit. I’m not looking to lose weight or try crazy diets, I just want to live a healthier lifestyle and be more active. Here are some tips! 2) Eat healthy snacks – be creative! This doesn’t mean that you have to completely ditch junk food, but try and stick with the 80/20 rule. 80% of your day’s food should be healthy, while 20% can be whatever you like. 3) Do exercises daily – they don’t have to long or hard – just do something! Set up a routine. I especially like doing workout/activities in the morning and at night. 4) Try new activities – change up your routine and you might discover something new and fun! Being fit and healthy isn’t about making everything strict and no fun. Try yoga, swimming, zumba, or rock climbing for a change! 5) Get motivated and inspired – I follow tons of Pinterest boards and Instagram accounts. One of my favourite websites is by Shawn Johnson. Check out thebodydepartment.com! 6) Find a workout buddy – it keeps it more fun. It could be your mom, friend, or, my favourite, your dog! I am really proud that i have been reading so much lately. Last year I hardly read at all. 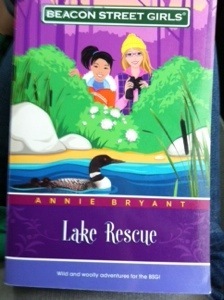 Lake Rescue is the 6th Beacon Street Girls book. The girls and their class all go on a four day field trip to Lake Rescue where they will learn about the outdoors and maybe some new things about themselves and each other. I think my favourite thing about this book is a new character named Chelsea Briggs. She is overweight and tends to get teased a lot. At Lake Rescue, with the help of her counsels Jody, she learns that being healthy doesn’t have to be a nuisance. She can have fun and discover new things about herself. Chelsea gets more self confidence and her classmates really start to enjoy her company and get to know her. I have been trying to get healthier lately and this book is great for that. It also highlights spending time outdoors and how it can be such a positive experience. I got to camp in August and am so excited! This will be my fifth and final year because next year I’ll be too old. Lake Rescue also shows the girls being able to accomplish way more than they thought they ever could. Sometimes you just need a little confidence boost and try to get out of your comfort zone and you’ll really surprise yourself. I just out of school and one of my favourite things to do is to write down the things I want to accomplish for summer. I’ve done this past years and think that it’s really fun and helpful. If you write something down I find it is so much easier to follow through with it. 1) Stretch, stretch, stretch! – I want to have a good over split in both sides, get my middle splits, and have a good scorpion by the time dance starts again in September. 2) Make money – At the moment I do not have a summer job so I will probably end up working on the farm for my dad. I really want to make money this year and work hard to get it. 3) Spend time with family – I hope to make some new memories and I want to take my little cousin swimming a few days. 4) Be more grateful – I want to look at the bigger picture and be more thankful for what I had and get to do. 6) Be responsible and trustworthy – This is referring to any parties I may or may not go to. I want my parents to know that they can trust me and I won’t abuse their trust. 8) Make the most out of my time – I don’t want to spend the whole summer inside watching tv. I want to make memories! 10) Be more considerate – I want to be friendlier and listen more and be more approachable. 11) Be healthy – I want to go for runs, swim for endurance, ride my bike, you name it! I also want to eat very healthy!